"For Animals Sake Resort - Napa Valley Dog Resort, Dog Boarding & Pet Care - A Vacation For Your Pet, AND You Too"
"A Vacation For Your Pet, And You Too"
When you know your pet is safe and happy, you can enjoy your time away even more! 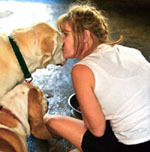 Established in 2000 by Lorna Borge, For Animals' Sake Resort is an experienced professional pet care providing facility located on her private 11 acre property in beautiful Napa Valley. For Animals' Sake Resort excels in providing a fun and safe family environment for your pet to play, exercise, and receive a lot of loving attention and care in a spacious country setting facility. 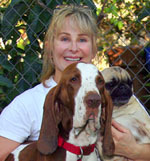 As owner, operator, and living on-site with over 20 years of professional experience allows Lorna to provide 24 hour specialized pet care, which is veterinarian recommended, insured, and licensed & inspected by the County of Napa. Click To Our Extended Family Photo Gallery!